This anthology, which contains my 100-word story, “The Elusive Pursuit of Perfection,” is now available in eBook form for Kindle, and it’s only 99 cents. All the stories in this collection of flash fiction are short, sweet, and oh, so good. This is a little book with big writing. You’ll enjoy it. To purchase your copy, click here; then you can go to Authorgraphs and get a digital autograph from me (as Phyllis Anne Duncan) for your copy. Sunday, September 22, is the first day of fall. Fall! Fall? How did that happen, I mean, besides the obvious motion of the Milky Way, our Sun, and our planet? Wasn’t it just January? Fall happens to be my favorite time of year. I like the crisp, cool air and the wonderful colors. I like the shift of light and the constellations predominant in the fall-to-winter sky. I love it when my BFF Orion returns. The season just seems to energize me physically as well as creatively. National Novel Writing Month comes up in the middle of fall, and I’ve never had a problem coming up with those 50,000 words. Fall makes me nostalgic as well, remembering Thanksgiving and time spent with my Dad. When he was still in the Army, I counted the days until he came home for the holidays, and I had some disappointments when politics meant he got deployed to West Germany too often. I think nostalgia came to mind when I saw today’s Friday Fictioneers photo prompt–a second-hand store, an out-of-date wedding dress, an elderly man. They led to the story, “Reminiscing,” something a little fluffier than I usually write. Yes, I can do fluff! As usual, if you can see the link on the story title, then scroll to the top of the page, click on the Friday Fictioneers tab, then select the story from the drop-down list. And a wish of happiness and love to Friday Fictioneers original founder, Madison Woods, for her wedding this weekend. Gotta love those happy endings. Bye, Bye NaNo! Hello, Friday Fictioneers! Today is the final day of National Novel Writing Month–and now the real work (editing and revising) begins. All over the country as midnight comes and goes in various time zones you’ll hear sighs of relief and cheers of victory as NaNoWriMo-ers validate their word counts. My NaNo region–Shenandoah Valley and Winchester Wrimos–is having a TGIO (Thanks Goodness It’s Over) dinner in Front Royal, VA, on Saturday, and it will be a great opportunity to meet some of my fellow WriMo’s in, you know, person. We can celebrate and commiserate and compare notes. I’m looking forward to it. Next month for me brings the publication of my collection of flash fiction, Spy Flash, and there’ll be plenty of details here on the blog on when it becomes available as both an eBook and a paperback on Amazon.com. 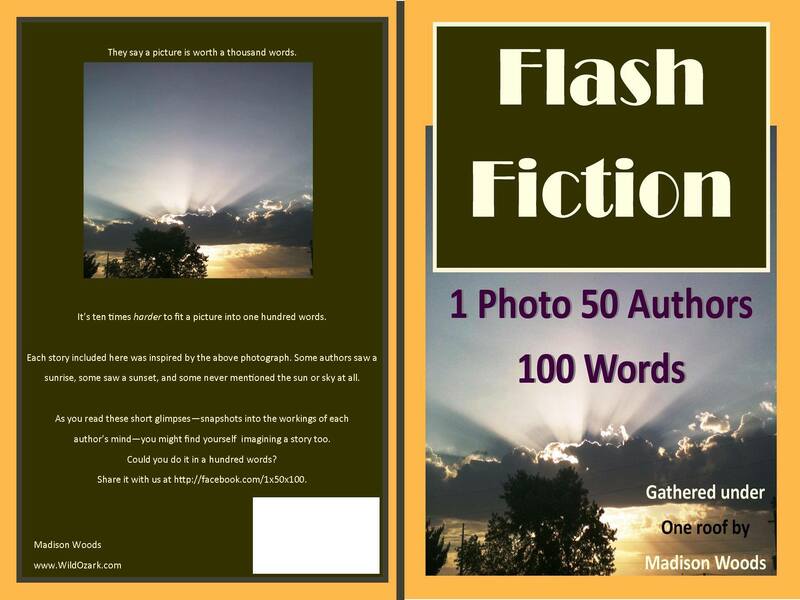 I will also have short stories appearing in two anthologies: The Blue Ridge Anthology 2013 and “100×100,” an anthology of 100-word stories on a single photo prompt, produced by the original founder of Friday Fictioneers, Madison Woods. Again, I’ll post details here on the availability of both anthologies. And just this week, I submitted a manuscript of flash fiction for Rose Metal Press’ fiction chapbook contest. All in all an exciting end to a Year of Writing Constantly. My story this week is aptly entitled “‘Tis the Season,” and it may put you off your holiday shopping. (Heh, heh, heh!) If you don’t see the link on the story title, then scroll to the top of the page, click on the Friday Fictioneers tab, and select the story from the drop down menu. All the photos we’ve used for these months of Friday Fictioneers have had a sense of place, but on occasion that “place-ness” is not just the fact that a photo has to be a representation of somewhere. It’s an actual place. Today’s photo for me evoked exotic locales, narrow streets and alleyways of the Old World. If you look close, in the photo you’ll see footprints, and the great perspective the photographer (fellow Friday Fictioneer Jan Morrill) has captured makes you feel as if you can walk into the picture. I don’t know if that was planned or by accident, but it’s brilliant. And I don’t mean place in the sense of setting. Every story has a setting, and it’s a key element in story structure. In some stories it’s incidental; in others you wouldn’t have the story without that particular setting. For me, sometimes “the where” the Friday Fictioneer photo shows is central to the story, i.e., it is the literal setting. Sometimes “the where” is simply a representation of what I want the setting to be. I mean, this picture could be a back ally in Podunk, Iowa, for all I know, but I wanted it to be some Old World city on the Mediterranean, some place where adventure abounds. And so it is. As usual, if you don’t see the link on the title, “DisHarmony” above, click on the Friday Fictioneers tab at the top of the page, and select the story from the drop-down menu. To read other Friday Fictioneers offerings–and I hope you do–click on the icon at the end of my story. Yet another Friday has rolled around, and the photo prompt for this week was unusual in its normalcy. You wouldn’t think a perfectly decorated and charming room would engender anything odd or outre, but, well, that’s the way my brain works. I see something normal and think about how I can make it abnormal or macabre. Not horror or gore, but I go to that plane of existence that’s just slightly shifted from reality. Or a picture can bring back a memory–a good one or one you’d just as soon forget. Even the worst memories can be worked through if you put your writer pants on and make, you know, lemonade. Without sharing too much, today’s story, “Shuttered,” could have been me if I’d have stayed in my first serious relationship, but I walked away from it and him. That saved my life. I know that, but it was still hard to admit failure. If you find yourself in a situation similar to that story, call your local domestic violence hotline. There is help out there, and you’re not alone. There is no failure in saving your life. If you don’t see the link on the title above, go to the top of the page and click on the Friday Fictioneers tab, then select “Shuttered” from the drop down list. To read other Friday Fictioneers stories for this week, click on the icon after the end of the story and enjoy! Again, I’m loving how writing a 100-word story based on a photo prompt is stretching me beyond my genre comfort zone. Frankly, writing a story about pixies or faeries? Not my thing. Then along comes a stunning photo, and, pop, into your head it comes, and it’s like nothing you’ve ever written before. Oh, you touch on fantasy with your two, little leprechauns, but this is the first time you write a serious fantasy piece–and you get to impart a message, too. Today’s story is called “Homo Avis.” If you don’t see the link on the title, then click on the Friday Fictioneers tab at the top of the page and select it from the drop-down menu. To read other Friday Fictioneers’ offerings, click on the icon after the story. Give Friday Fictioneers a try–as in participating and writing a 100-word story–and stretch your comfort zone. This week’s Friday Fictioneers’ photo prompt might give you a little shiver. I know I did, but I have this thing against spiders. (For those of you who may share my arachnophobia, the picture is of an intricate spider web, not the creepy creature itself.) Thanks to Rochelle Wishoff-Fields for such a fear-inducing and inspiring photo. Of course, I went right to my fear of spiders, which likely found its origin in some 1950’s B-movie about nuclear fallout creating giant insects. I know I never looked at an ant the same way again after seeing Them. It’s no surprise either that for the second time in a few weeks, I included a Star Trek reference. Star Trek was the first television series where I paid attention to the writers, not just because they were some of the sci-fi genre’s finest, but because the stories were so good. I wanted to grow up and write like that someday. If you don’t see the link on the story title above, go to the top of this page and click on the Friday Fictioneers tab, then select “Tangled Webs” from the drop down list. To read other Friday Fictioneers’ offerings on the photo prompt, click on the icon after the story. Enjoy, and I hope you don’t dream about giant spiders tonight. The Wee Folk Return to Friday Fictioneers! I’m not sure where the beautiful photo for this week’s prompt was taken, but its stark beauty really struck a chord with me. An idea of what to write came to me as soon as I saw it. Regardless of where the photo was taken, it said Ireland to me. There have been many waves of immigration from Ireland to America, but the one we’re most familiar with was the one created by the mid-nineteenth century potato famine. Most farmers then in Ireland rented plots of land from usually absentee landlords. When the potato crop failed, they couldn’t pay rent. The landlords would then raise the rent in an attempt to ensure their income, and eventually so many people wanted a place to live, the landlord’s men would come and evict a family then move another in immediately. They couldn’t grow anything either, and they would be evicted, and the cycle went on and on. America was the land of opportunity for those Irish immigrants, but they arrived and saw the “No Irish Need Apply” signs when they searched for work. Regardless of which migration, it was usually spurred by poverty, and too many times they migrated to another form of poverty. That was true of my grandmother, though her migration wasn’t until the first third of the twentieth century. She was convinced, however, that the wee folk had migrated to “A-mer-i-cay” at some point because she left milk and bread out for them every night. This week’s story is “Diaspora,” and it features two leprechauns–Seamus and Declan–I’ve written about before. Though this is a little more serious topic than the other stories, Declan still thinks only of himself, and Seamus sees the big picture. If you don’t see the link on the title, click on the Friday Fictioneers tab at the top of the page and select “Diaspora” from the drop-down list. To read other stories (or to post one of your own) from Friday Fictioneers, click on the frog-like icon at the bottom of the story.